In 2005 I was experiencing some personal challenges and knew something had to change for me to feel a deeper sense of accomplishment and fulfillment in both my business and my life. At that time, I was studying various methodologies and approaches to coaching, including NLP (Neuro Linguistic Programming) and EQ (Emotional Intelligence). As a result of my research, I became intensely aware of the power of my thoughts and words, as well as the importance of remembering who I really am, a spiritual being, having a human experience. Those two premises influenced me greatly and I started writing daily affirmations that identified a thought process and habit that I wanted to embed in my subconscious mind— thoughts and patterns that I believed would serve me far better in the future than those held in the past. Prior to that time, I had created, developed, and taught, through seminars and workshops, a process for growth and change that I called The GROW Principle®. When I merged that 4-step process: Gratitude – Release – Openness – Willingness, into my daily affirmations, I noticed how they flowed with even deeper intention and meaning. Having also developed a following with The GROW Principle, I started sharing these daily affirmations by email in order for people to wake up with these messages in their inbox each morning. They were called The Daily GROW and they received a great deal of positive feedback from those who received them each day. Over the years, these messages, created to inspire, motivate, and positively influence our daily lives, evolved and developed into the next incarnation, entitled The Daily Conscious Leader, still following the flow of The GROW Principle process, and designed more with business, work, and leadership in mind. These, too, received positive support and feedback. Then, in 2015, as my wife, Samantha was developing M.A.D. Leadership to make a difference in the lives, work, and world of Aspire attendees and The Aspire Foundation mentors and mentees, I changed the name one more time to The Daily M.A.D. Leader. The content remained the same, with leadership in mind, with only the name change. This has again received positive reviews and feedback. Now, in its 12th year, we have accumulated a library of more than 2,500 unique, daily messages that continue to be shared, free of charge to individuals and leaders all over the world. 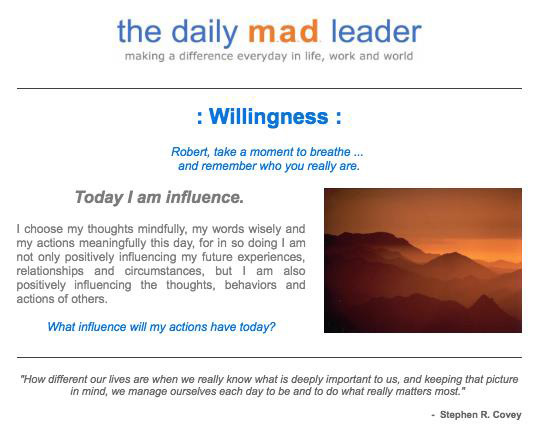 If you would like to receive The Daily M.A.D. Leader by email each weekday, please click this link to sign up. Robert Silverstone is an executive coach, author, speaker, husband of Dr. Sam Collins, and proud father of our 3 young and M.A.D. children!